I actually moved back home after this incident. Osumi couldn’t believe it. Two days later he called me and said, ‘Nilikuambia tutameroga. Nimeipata kwa takataka. Rudi nyumbani‘ So I went back to the LOFT to clean up the mess left by the rat. On the way to the LOFT, I bought some rat poison just in case another attack occurred. Two weeks ago, I decided to treat myself to fries. I hadn’t had fries in a while and was very excited at the thought of just sitting down to eat fries. When I went to buy the fries, there were too many customers so they guys selling were not interested in my stories of ‘kausha kabisa’ so I resolved to re-fry the potatoes at my house. I got to my house, put on the cooker, poured oil into the fryer and realised that I had run out of kitchen paper. No worries, I would dry the fries on a newspaper. Do I have any newspapers? Hmmmmm. Where could I have kept newspapers from 2010? I opened a drawer of my sitting room cabinet and two small eyes stared back at me. I closed the drawer in a panic. Did I just see that? No. Hallucinations. I opened the drawer again. And saw a rat running away into the folds of the cabinet. NOT AGAIN!!! Where is my phone!? I tried calling Osumi and for once he wasn’t available Seriously. On the day there is a rat in my house! I think the rat sensed my panic and it ran from the cabinet and went under a seat. Think Njenva. Think!!! First things first. Switch off the cooker. I had to eat fries on that day so there was no way that I was going to move back into Mrs. Adrian’s house. So I was going to deal with the rat. I closed all the doors to all the rooms and changed into gum boots, shorts and a sweater. I also tied my braids into a pony tail. Short of painting make up on my face like war paint, I was ready for battle. I sent a message to Skinny and Hipilicious letting them know that I was going into battle and that should the other party win, I went into the battle willingly. I took two brooms as my weapons of choice and opened the balcony door. After making my war cry (‘I will not be intimidated by a lower class mammal‘) I lifted up the seat where the rat had run into. It was actually a rat. I think up to that point I was still in denial, faulting my eyes for seeing things…. I tried poking a broom under the sofa but wasn’t getting any results. I decided to take the battle to the next level. I pulled the seat towards me and lifted it up while at the same time, using the broom to poke underneath. That yielded results. The rat came scampering out. And my heart started beating at triple it’s normal rate. Woi. I chased it around the room, thank God I was in gum boots because at some point it jumped over my foot. Then the battle begun. I tell you I beat it like a burukenge. I trapped it into a corner and beat it thoroughly. After it had taken some beating, it found an opening and escaped the corner and shock of all shocks. It fit under the main door and escaped. I couldn’t believe it. I ran out after it and didn’t find a trace of the rat, so I don’t know whether it went to C’s house or to Miss. P’s house!!! I think it took about an hour for my heart beat to settle down to be able to cook my fries! Last week, Hipilicious couldn’t go to work due to a hurt back. She took diving to the next level during this trip that she may have slipped a disc. For this reason, she was given sick off and she came over to my place to recuperate. On the first night that she was at my house, I heard some noises from some part of the house when I went for a bathroom break. I was in shock. Seriously. The rat was back!? I just closed all the doors to prevent it from having a free reign in the Loft and went back to sleep. The next day I was at Bible Study and Hipilicious was watching movies at my house. Then, KPLC did what they do best at about 7pm and in the darkness, Hipilicious heard the rat. Njenva, did you kill the rat the other night? Yap. It is not a rat. 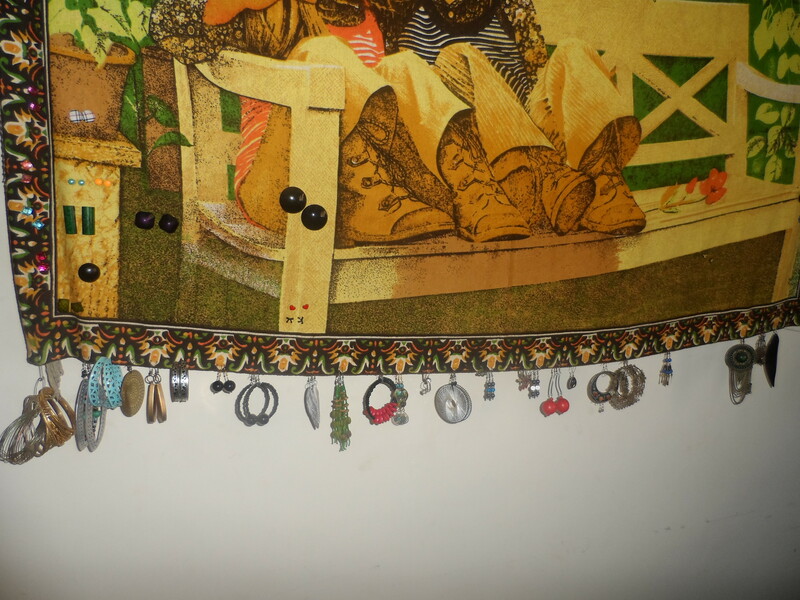 Earrings on a piece of cloth hung on a wall…..